Back in September I wrote a post entitled Preparing for the Possibility of a Lady Gaga Oscar Nomination in the wake of its rapturous premiere. The post was tongue in cheek, I suppose, in that way of me wanting to frustrate loyal frustrated readers with one of my patented ridiculous recurring bits. But a funny thing happened on the way to the recurring bit – that is, I saw “A Star Is Born.” I never thought Gaga was going to be bad, mind you, but I also never thought she would take me to the mountaintop. I never thought she would make me feel like I was seeing her for the first time all over again, which is what she did when she sort of airily bounced away from the camera as her character walked out on her job, carrying me away on her Gaga feathers, and then showed up at the gig and almost impercetibly choked back vomit before she hustled out onstage and then closed her eyes and totally Gaga-ized the vocal and, sweet mercy. I waited a decade for her “Thunder Road” moment; that was her “Thunder Road” moment; I welled up. Still, she was good in a way my exorbitant passion for all things Gaga does not do justice. She nailed line readings, sure, and added indelible little bits of actorly business, as that aforementioned nigh vomit suggests, but she was good in so much as she was, you know, giving a performance by creating a character. That her Ally could remain resolute as her star rose was directly connected to her father’s kitchen and her resolve in the face of him and his idiot friends. Gaga played the role like the character, to paraphrase Bruce Springsteen, knew where she came from every inch of the way. And so, her legit acting brilliance combined with my intense Gaga devotion made it so that I was no longer rooting for her Oscar nomination or even rooting for her to win the Oscar; I pulled a Jedi mind trick on myself and became convinced she really would win the Oscar. She still might. Who knows? I certainly don’t. But Glenn Close winning the Golden Globe for Best Dramatic Performance in a mild upset (in so much as the Hollywood Foreign Press Association typically opts for drooling over its biggest stars) brought me back down to earth. It makes me think it might be Close’s “time”. Granted, I was ready for it to be Annette Bening’s “time” two years and she didn’t even get nominated. But the drumbeat for Close’s “time” seems louder. 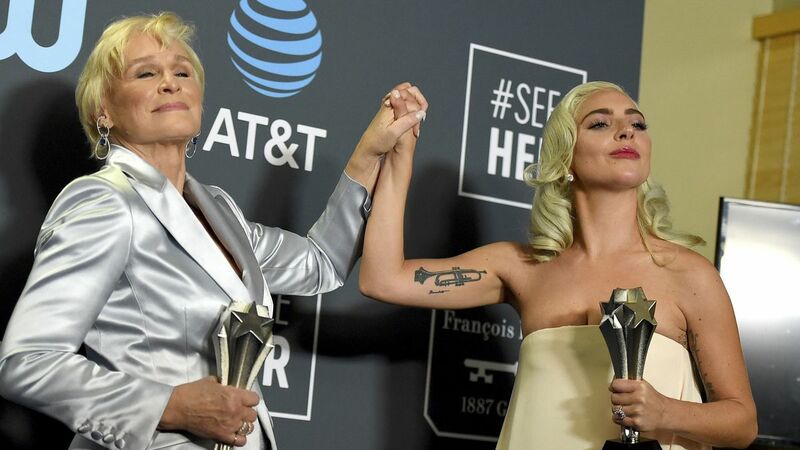 And whereas once, in the unlearned wilderness of youth, I was strictly opposed to “It’s Her/His Time” Oscars, I am now completely cool with them as something like professional karma, and Ms. Close has starred in over 50 feature films while Ms. Gaga has starred in 1. That is not to suggest Close’s performance in “The Wife” is not worthy; it is. I had issues with “The Wife” itself, but not with Close, as I outlined in my review. And this is not to suggest Gaga’s performance in “A Star Is Born” is not worthy. As a critic, I think it is. And as a critic, I see an even more interesting angle. Closes’s role, as the title suggests, is an inversion of the Long Suffering Wife archetype. Her husband is a Nobel-winning author who (spoiler alert!) does not seem to have actually written his Nobel-winning work; his wife did. 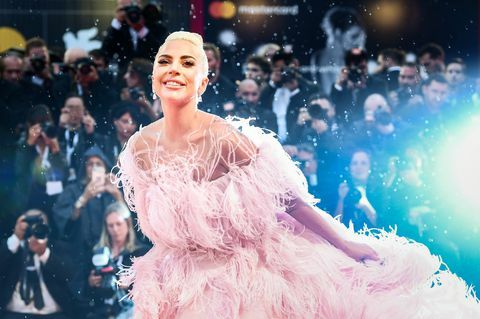 Gaga’s role is as a sudden singing star who quickly surpasses the mentor – Bradley Cooper’s rock star – who discovers her. Yet if Gaga’s character and performance define the film, the film is about Cooper’s character realizing he is being passed by and, failing to cope, checking out, spiritually and literally. It’s a curious thing, empowering her even if the camera turns its gaze somewhere else, cosmically linking these two women in a way, both more advanced than the men they stand beside that (reluctantly) stand beside them. Gaga and Glenn were literally linked at the recent Critics Choice Awards where they tied for Best Actress. Ties, reader, warm my jaded heart. “Ties are Switzerland,” sportswriter Stefan Fatsis recently said on an episode of the Hang Up and Listen sports podcast. “And who hates Switzerland?” he asked before taking the position of a prospective dissenter and continuing, “But you say, Switzerland is boring. And that’s why America hates ties. We hate neutrality, we cannot abide indecision, we demand resolution.” Indeed, at the 2014 Winter Olympics in Sochi American skiing great Picabo Street had a mega beef with the scoring system that permitted for a Downhill tie between Slovenia’s Tina Maze and Switzerland’s Dominique Gisin. Too bad Street couldn’t be a little more like Maze who saw her co-Gold Medal not as cause for grousing but the genesis for “two happy faces.” And that’s what I thought of when I saw Gaga and Glenn standing together. Who knows what would happen if the Academy somehow managed to replicate that tie. I imagine Film Twitter would be full of Picabo Streets. But the Oscars have been down this road. You might remember the 41st Academy Awards. You might remember a famous singer winning Best Actress for her first acting role and you might remember a legend, a lioness winning Best Actress too. Sounds a little familiar. Sigh. A boy can dream, can’t he?